Titan 660 plus has four 120 mm fans as a standard: one installed in the front and another one in the back; moreover the design allows for installation of 5 additional fans. A precious function is also the possibility of adjusting the fans power with use of special controller on the upper panel in the front. Moreover 2 anti-dust filters are included. The maximum processor cooling installation height for Titan 660 is 160 mm. 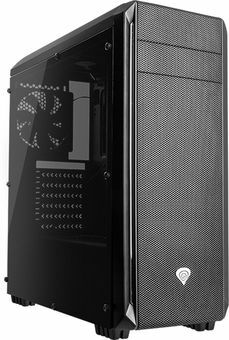 The casing is additionally designed for installation of water cooling up to 240 mm. The lower part of casing is designed in a way assuring sufficient space for PSU (ATX pS2 standard) and mainboard. Titan 660 plus is compatible with ATX, Micro-ATX, and Mini-ITX. Each gamer appreciates easy and convenient access to places like USB ports or jack sockets. The Genesis casings have all ports located in the front part. Titan 660 offers USB 3.0 port, two USB 2.0 ports, and HD audio, as well as the fan controllers mentioned above. Titan 60 plus is additionally equipped with acrylic window, which gives it a character and allows the gamer for showing the world what is inside their computer. Mātesplates stiprinājumi ar visai lielu nobīdi.